Simple steps can help keep some hard to clean areas free of radioactive iodine contamination. Place a plastic drop cloth between your sheets and mattress pad. This will keep contamination as you perspire at night from getting into your mattress or mattress pad. Always wear socks or a cheap pair of slippers you can throw away once isolation is up. 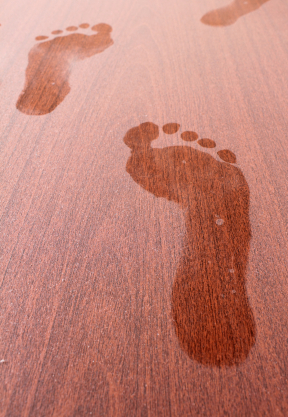 The soles of your feet perspire and bare feet can lead to contaminated rugs and carpets. Throw away your toothbrush and toilet brush after your isolation period is over. After blowing your nose, never put the tissues in the trash – flush them. Make sure to clean telephones, tv remotes, doorknobs, faucet handles, etc.. Bind-It ™ Ready-to-Use Spray works perfect for this. Wet a paper towel with Bind-It ™ Ready-to-Use Spray and wipe the object. Never spray onto electronics. Your hands will sweat, wash you hand often with Bind-It™ Hand Soap to avoid spreading contamination. NEVER use bleach to clean where radioactive iodine contamination is suspected. Bleach can cause the iodine to become gaseous and airborne, potentially spreading contamination and leading to possible inhalation by others. 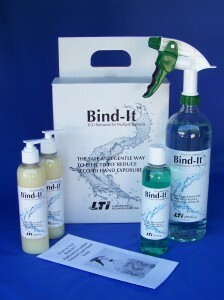 – Pre-treating hard to clean areas like the grout between bathroom tiles with Bind-It ™ Ready-to-Use Spray will make contamination removal even easier.